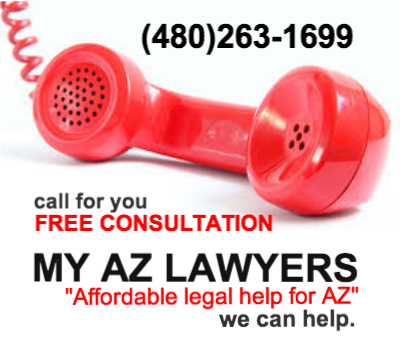 If you have any questions regarding bankruptcy or debt relief, contact My AZ Lawyers. An attorney dedicated to helping Mesa, Arizona residents eliminate debt and find financial success would be happy to answer your questions concerning your financial happiness. You may also schedule a FREE consultation at our law firm and speak to an attorney in office. You probably have many questions and concerns, and My AZ Lawyers understands that the entire process is complicated and confusing… let us handle the legal representation. The first step is to get informed and feel comfortable with how you are going to tackle your debts. In no time you will be on your way to a brand new outlook on life with a fresh financial start. Furthermore, My AZ Lawyers will assess your situation, and help you to proceed. Q: I read online I have to take a class if I want to file for bankruptcy? Where do I do this? When do I do this? Before you file for bankruptcy, you must participate in a credit counseling session and get a certificate proving that you have done so. This typically costs around $50 to $75 and takes about 90 minutes, and can be done online or over the phone. Also, your attorney can give you more information as to the nature of the class. Q: If I am broke, how can I afford to pay an attorney to file a bankruptcy? Unless you are an expert at Arizona bankruptcy law, policy, and procedure, we recommend that you get the legal advice and help of an attorney who has extensive knowledge in this practice area. At least take advantage of a FREE no hassle, no obligation CONSULTATION by phone or at My AZ Lawyers office to get some idea about the process. How can you pay attorney fees when you are feeling consumed already by all kinds of other debts? My AZ Lawyers makes excellent legal representation affordable. The firm offers a “File Now, Pay Later” payment plan. Ask the firm how they can work with your budget in order to make your financial success a reality. Q: I am afraid to go to the 341 hearing with the trustee and face my creditors. There is nothing to fear, as My AZ Lawyers will have prepared your bankruptcy and prepared you for the meeting. They will be with you to fight for your rights and to help you answer to your creditors. My AZ Lawyers have experience with many bankruptcy situations and the attorneys are confident and effective at court. Q: I am a bit embarrassed to call and discuss bankruptcy and my financial situation. My AZ Lawyers understands the need for debt relief. They understand the stress and frustration and anxiety and embarrassment that their clients experience as they try to deal with their financial issues on their own. Sometimes the debt is too excessive, too overwhelming and you need to talk to an expert that can help. No judgement, total confidentiality… the staff at My AZ Lawyers is concerned only about protecting your rights and getting you the best possible outcome for your case.